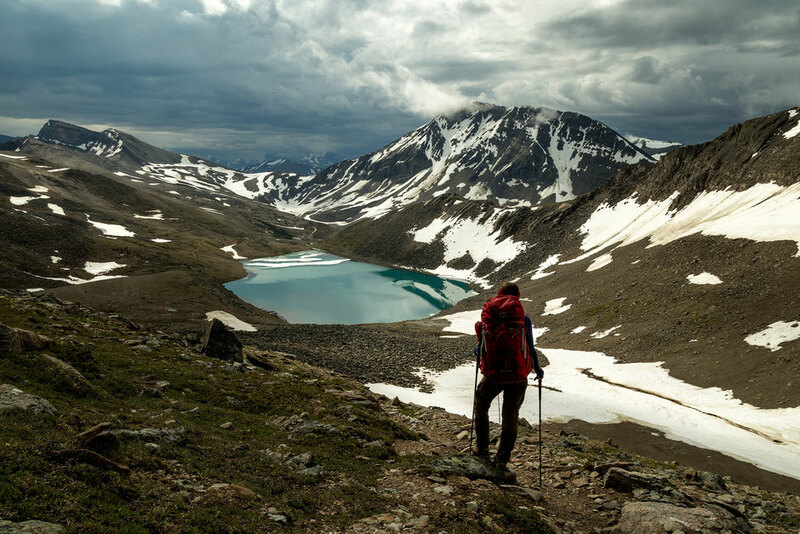 The Skyline Trail in Jasper National Park is considered to be one of the most stunning multi-day hikes in the whole of the Canadian Rockies, It stretches for 44 km (27 miles) and it can be done over 2, 3 or even 4 days. There are extreme trail runners that do it in one! Personally I call them crazy. 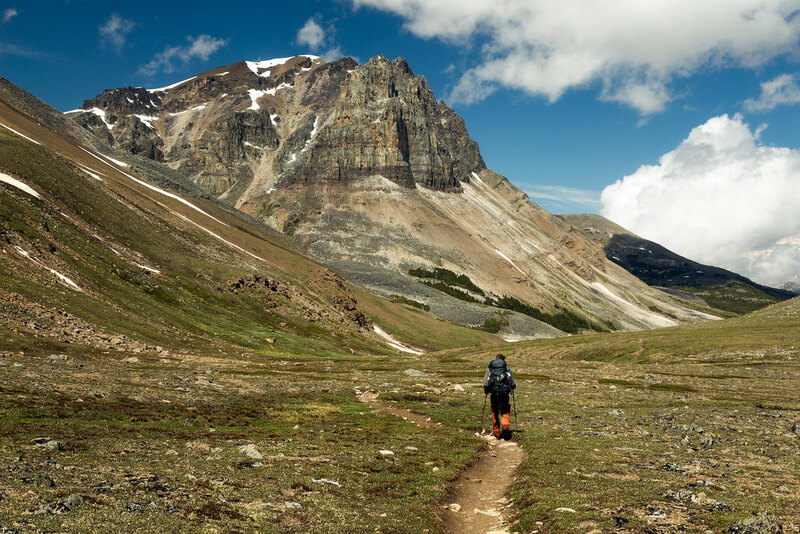 The trail makes its way through 3 major passes along the Maligne Range stretching from the shores of Maligne Lake to the northern trailhead at Maligne Canyon. 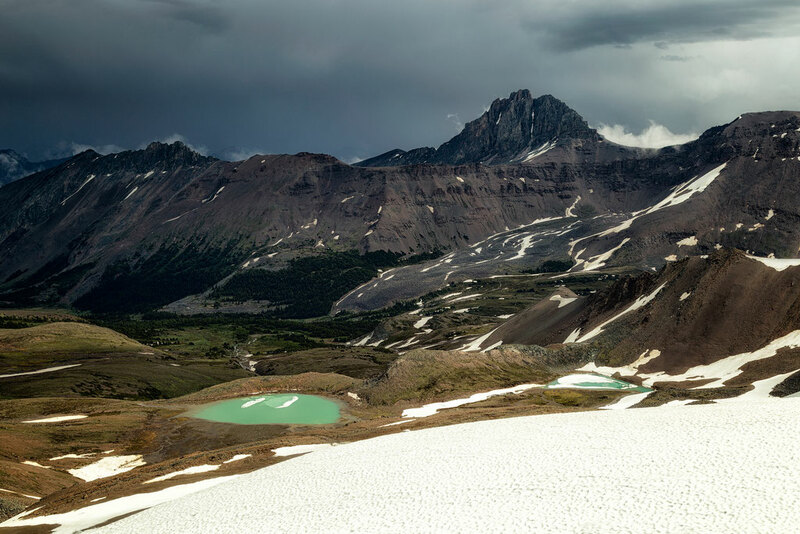 It is also handily split up by very well located campsites at the creeks, which flow down from the nearby glaciers and snow drifts. A truly remarkable journey filled with glacial lakes, alpine tarns and mountain vistas. 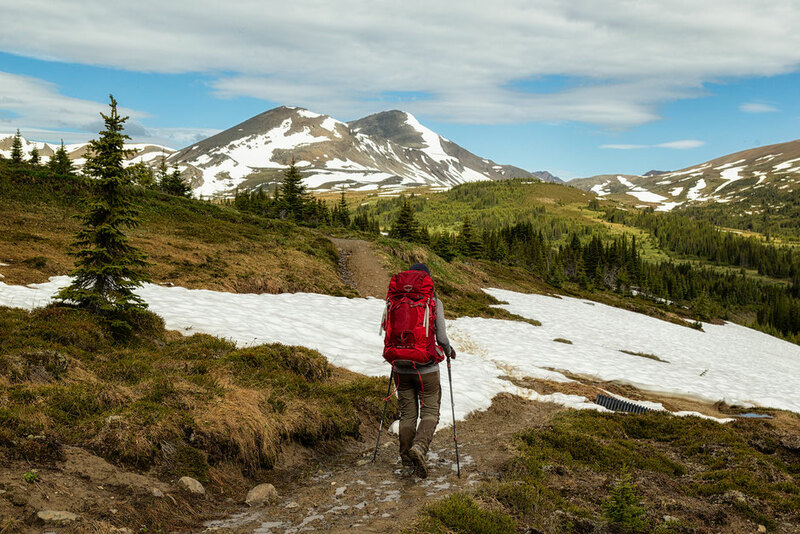 Backcountry hiking and camping is very popular in Canada and understandably, due to very limited spaces the Skyline trail books up months in advance. When the booking system for Skyline opens at the start of January, most of the slots in July and August are taken within the first few days. Which end should I start hiking the Skyline Trail? There are two trailheads for the Skyline Trail. The southern one is from the shore of Maligne lake, a 48 km (30 mile) 1 hour drive from the town of Jasper. 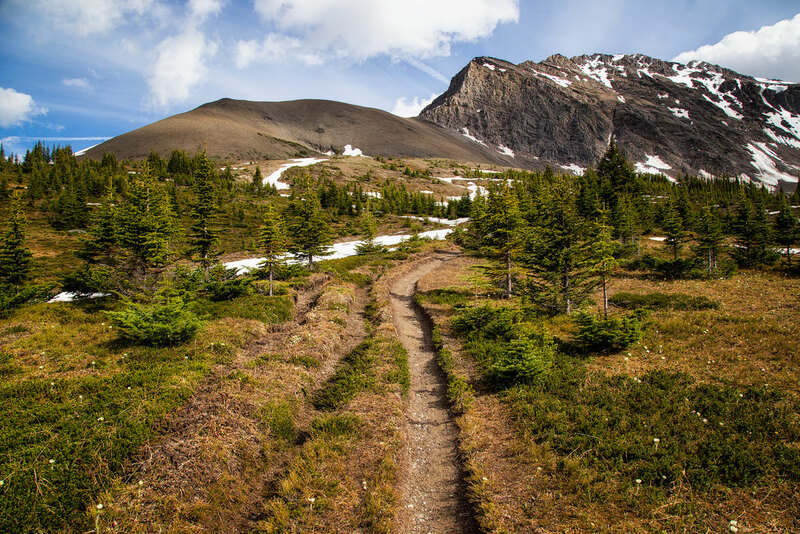 The northern trailhead - signal mountain, lies only a few hundred metres away from Maligne Canyon, an 11km/15 minute drive from Jasper. 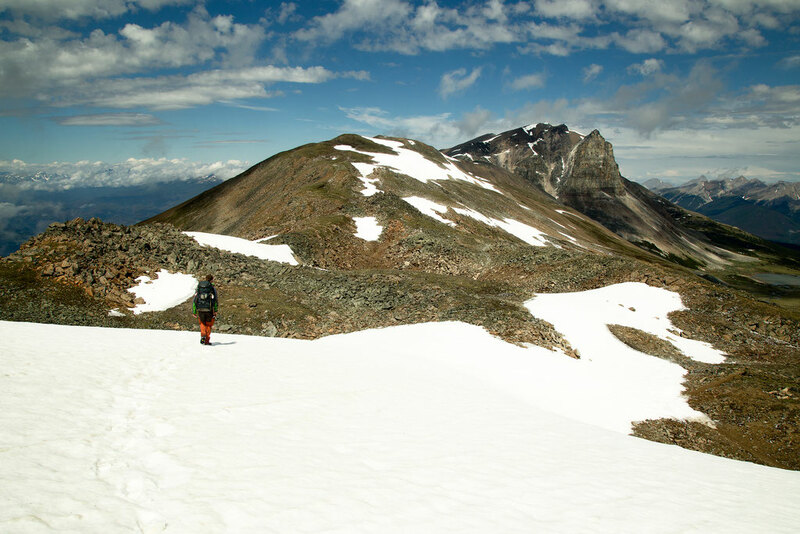 I think the better option is to start the hike at Maligne Lake and finish at the Signal Mountain. This trailhead lies at a higher elevation so it will be a bit easier. Another advantage is that once you get up to the ridge, past the infamous notch, the views will be all in front of you, not behind you. 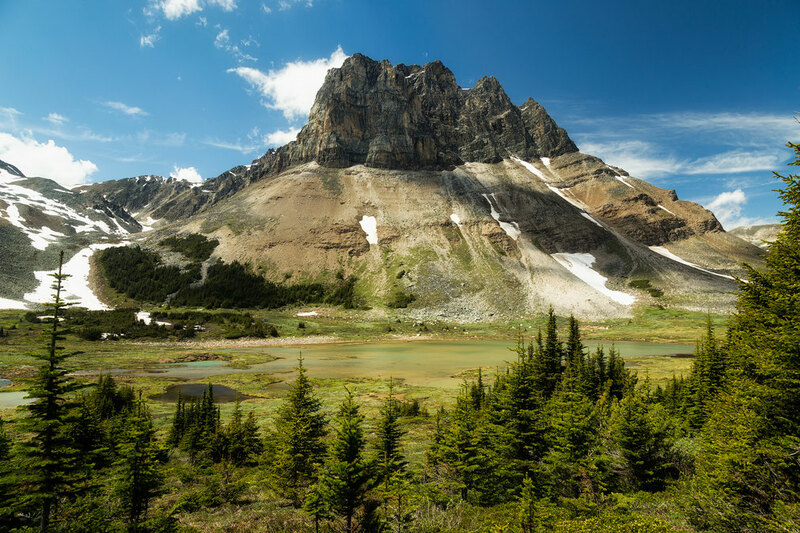 If you have a vehicle, my advice would be to leave it at the northern trailhead, then either shuttle or hitchhike to Maligne Lake to begin the hike. We hitchhiked between the two trailheads as we always do. As long as you don't look like an axe wielding psychopath killer you should be able to pick up a ride pretty easily. It took us about 2 minutes. This way, once you've completed the hike, you don't have to worry about waiting for a ride and can just drive away, probably to the nearest shower and to grab some proper food. If you don't feel comfortable hitching or it's simply not your thing then Maligne Adventures offer a shuttle for 30$ per person per way or 60$ return if you're coming from Jasper. The track is well set up with multiple campsites that contain the usual: bear lockers/hooks, running creek water, outhouses (minus the house) and cooking areas. 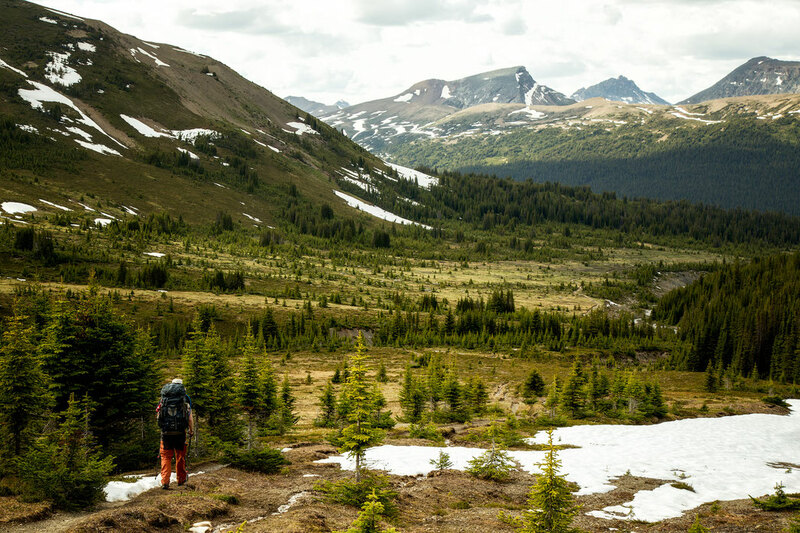 As usual, don't expect any luxury in the Canadian backcountry. There's one lodge halfway through near the Curator campsite which has better toilet facilities but they are not available to the general public, just to their own patrons. It was the first time for me using outhouses without the actual house on this hike. It was a bit nerve wracking sitting on the throne in the middle of nature where at any moment another hiker could pop up and see you doing your business. The hike starts from near the last of 3 car parks, you get to, when arriving at Maligne Lake. It's well sign posted. If, like us, you're not comfortable with leaving valuables in your vehicle overnight. The Three Sheets Laundry in Jasper (close to the visitor centre) will store your belongings for $2.50 per bag per day. One bag filled with laptops, passports, hard drives and a few camera lenses cost us 10$ for our trip. A very low price for a lot of peace of mind. Maligne Lake is a stunning stop before embarking on your adventure, consider doing a cruise to Spirit Island. 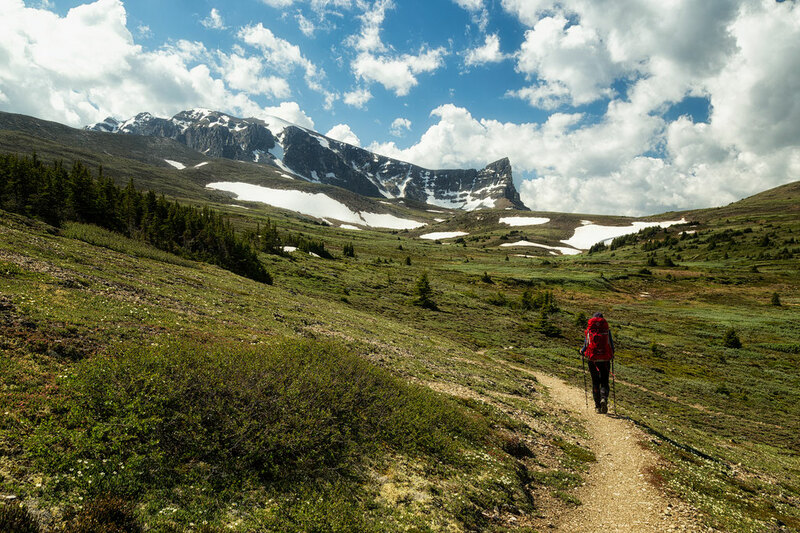 It's also home to many trail heads for the best hikes in Jasper and a multi-day paddle to Spirit Island and beyond. As you can see from the elevation profile. The trail head at Maligne Lake (on the left) is much higher than the Signal trailhead (on the right). By doing it in this direction you spend the 8.5km section from Signal Campsite to Signal Trailhead going downhill instead of uphill. The best two campsites on the entire trail are Curator and Tekarra and the 10km that separates them is the most visually exciting part too. 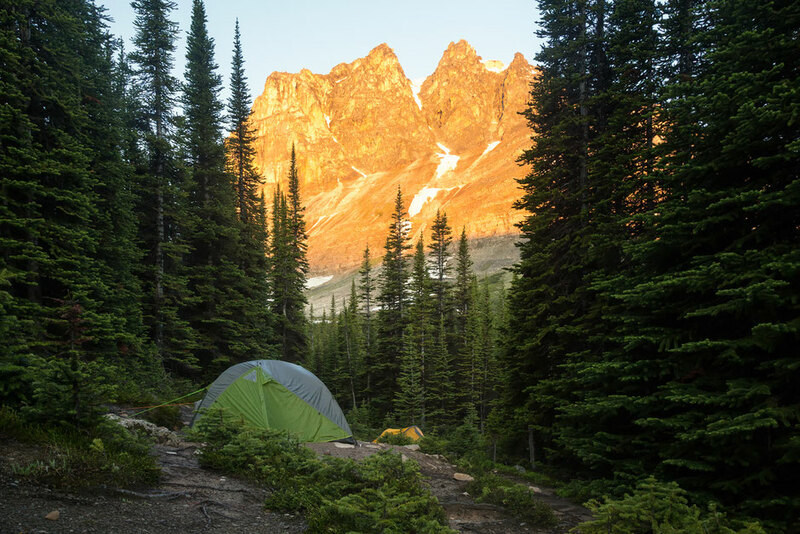 Try and spend at least one night at either of these sites then, regardless of which direction you're doing the trail, you can tackle the ridge line and The Notch early in the morning when the light is best. Personally, I don't like to rush and did the Skyline over 4 days (3 nights). For me, and probably most people contemplating doing this trail, the campsite at Evelyn Creek isn't far enough in to warrant staying at. 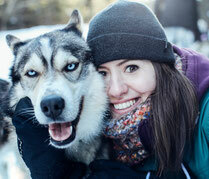 Instead your first night should be at either Little Shovel or Snowbowl. 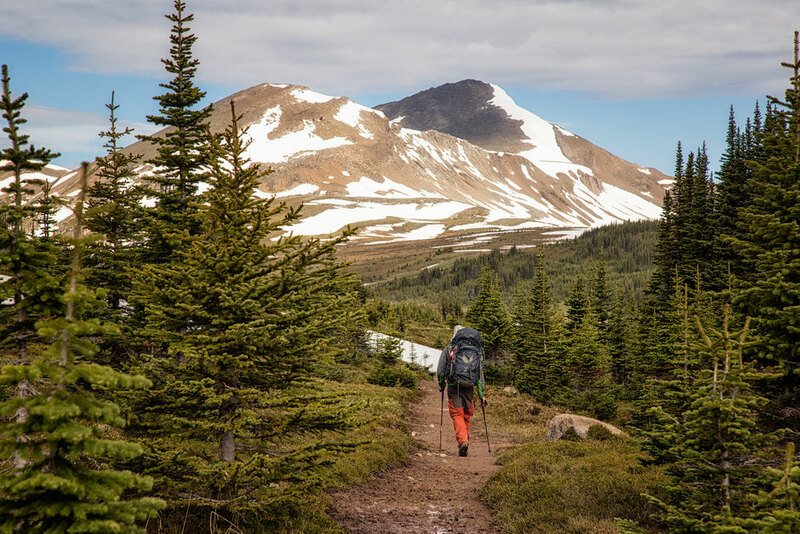 The trail from Maligne Lake slowly rises through the forest, which can be very wet and muddy throughout the entire season, until it breaks through the tree line just after the Little Shovel Campsite. The first of three major passes is now in front of you. 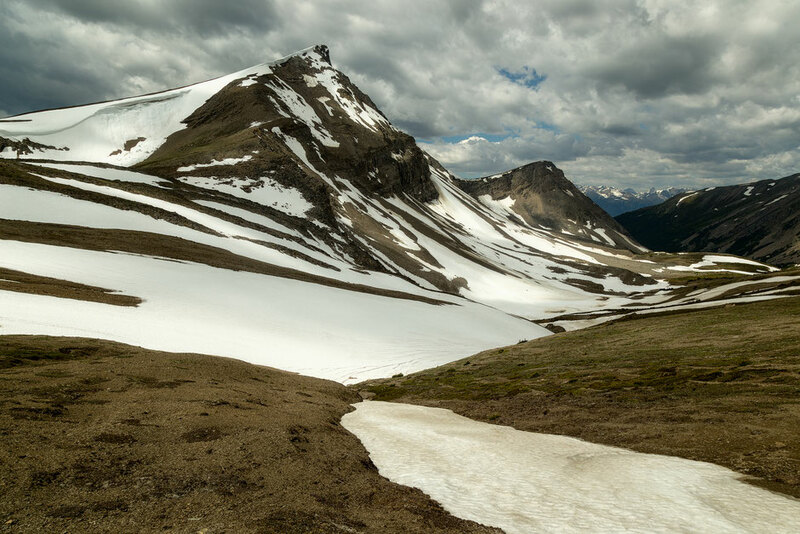 This one, at 2200m elevation, is called Little Shovel Pass and snow can be found here until mid July, sometimes later. Marmots can be seen sunbathing in the alpine meadows and the wildflowers are spectacular from mid July onwards. 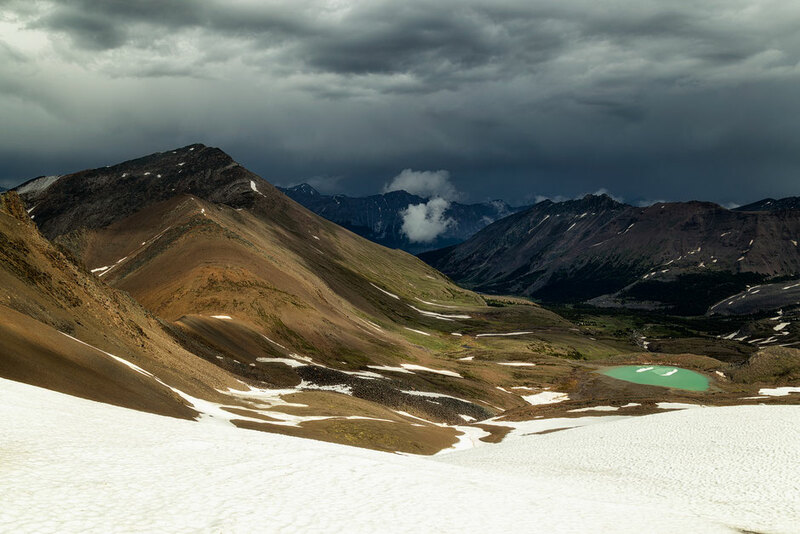 After spending a night at either Little Shovel or Snowbowl, you will have a relatively easy day over the Big Shovel Pass at 2286m toward Curator campground. This is when the trail starts to get interesting and it's when you'll first see The Notch, where snow lingers until August. After the pass the trail bends right before descending over 100m down and 1km away from the Skyline Trail where you can find the Curator Campsite. That's one thing you have to bear in mind, the Curator Campsite is not strictly on the Skyline Trail, if you're staying there then your total distance will be 46 km instead of 44 km. 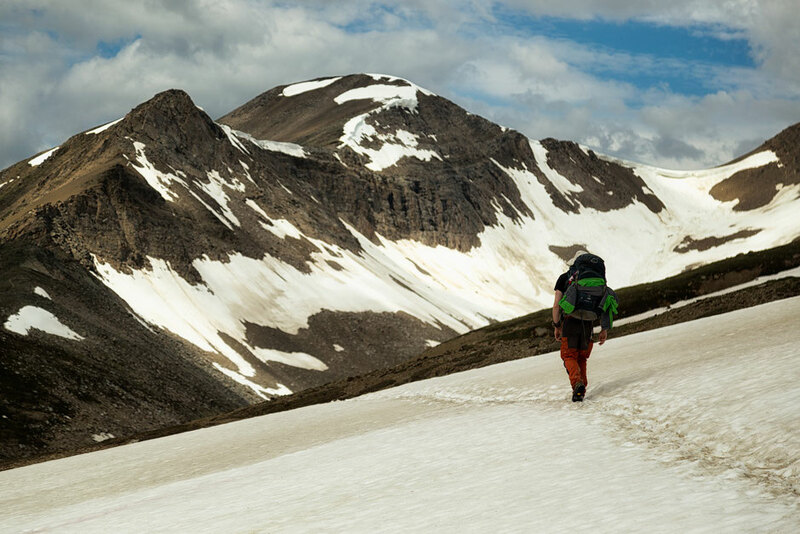 Leave early from Curator Campsite, this way not only will the views be at their prime, but the snow at the Notch, if there is any, will be at its most supportive. 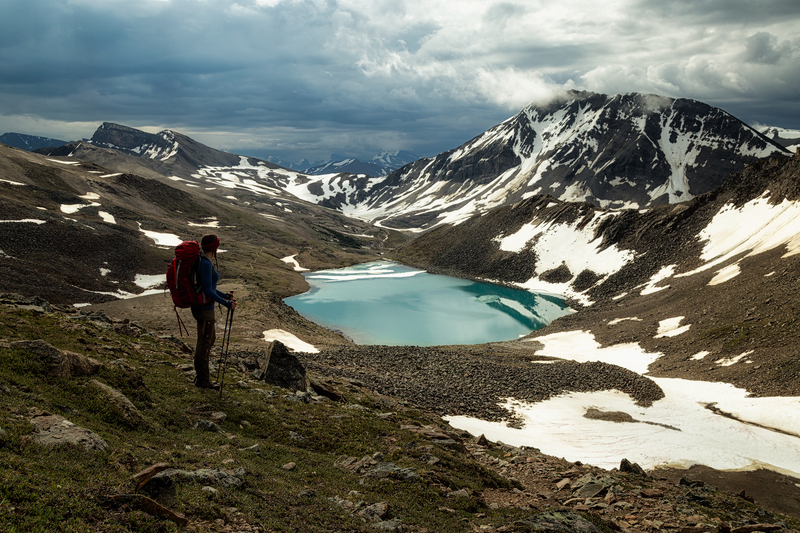 From the trail to the shore of Curator Lake is around 100m so it shouldn't be missed. 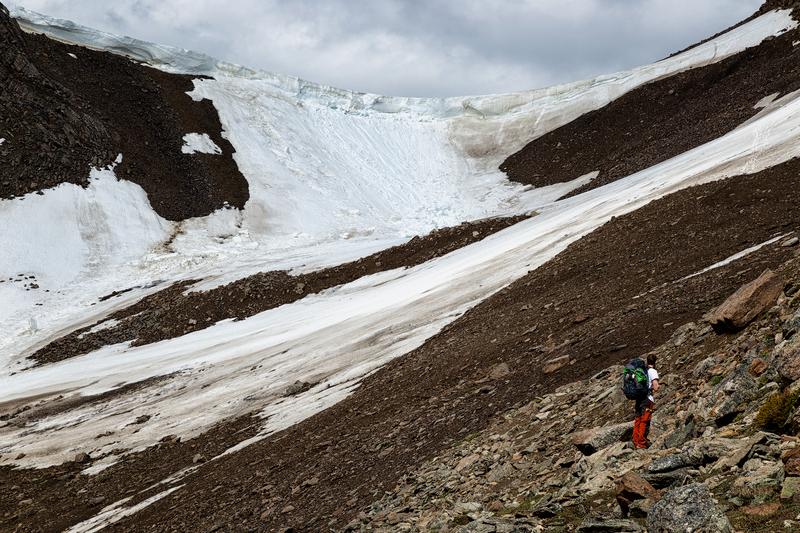 After passing the lake, the well worn path, becomes very steep until it reaches the highest point, the Notch at 2400m. Congratulations, you've done the hardest part, now enjoy the views that follow. 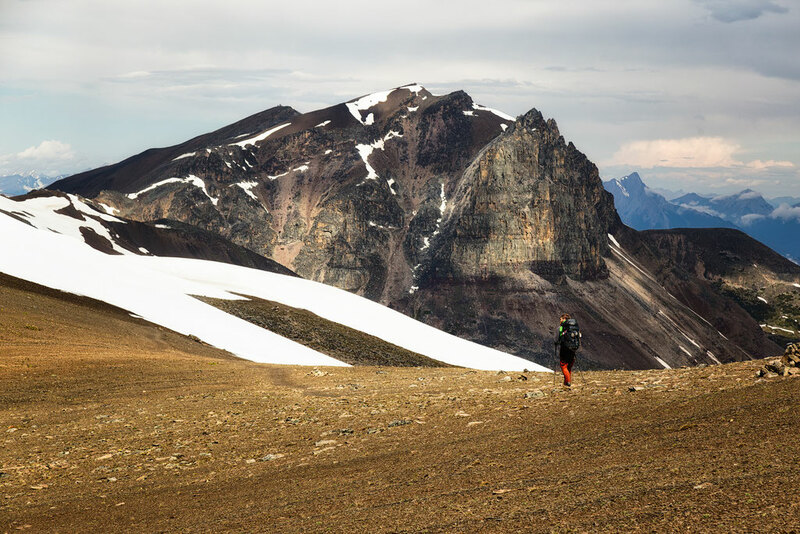 From passing the Notch the trail flattens and you walk along a scenic ridge line which offers jaw dropping vistas of the surrounding ranges, in particular Mount Edith Cavell and on a clear day the Canadian Rockies tallest mountain, Mount Robson. After a few kilometres of the most intense eye-gasm, the trail then slowly descends through the rocks and fields toward the prominent Mount Tekarra. 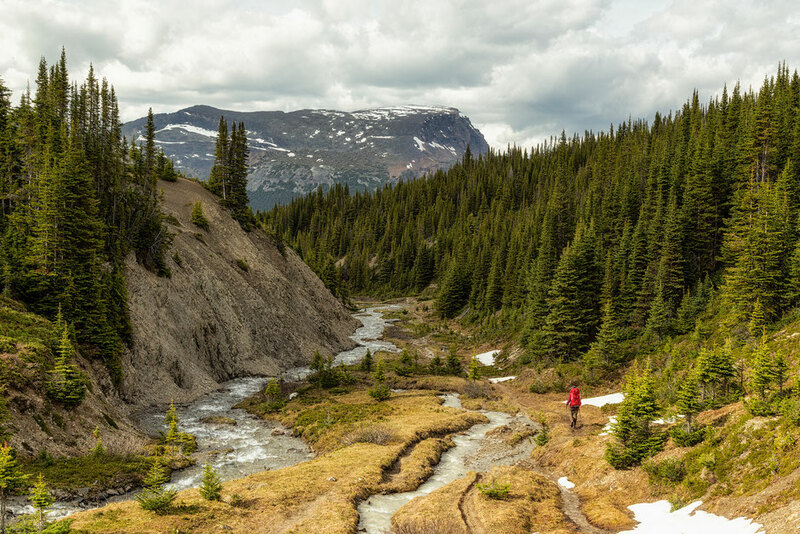 The muddy path leads past flowing streams and small lakes until you reach campsite. The Tekarra campground lies next to the longest of river crossings on the trail, in the shadow of Mount Tekarra, a huge slab of raw rock. In late June / early July when all the snow is melting, the trail fords 5 streams each with varying difficulty but all easily manageable. 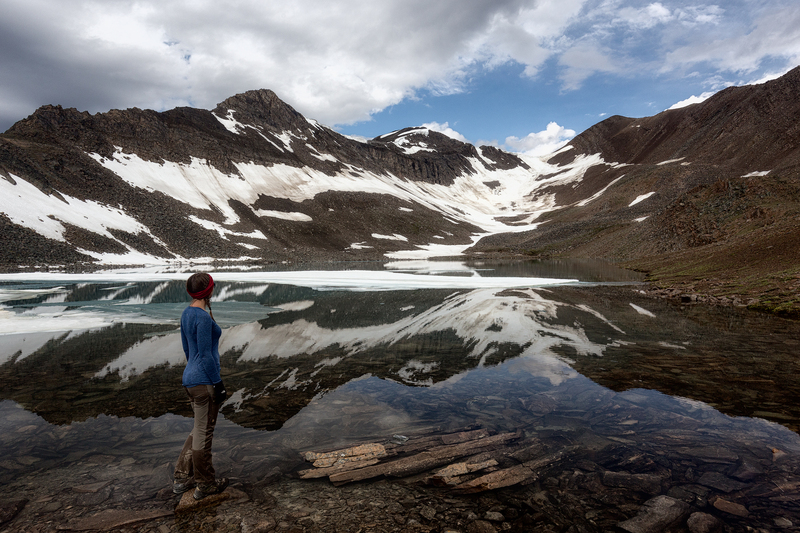 The number one complaint from hikers we heard on the trail was wet feet. Not because the trail was too difficult or poorly maintained but because of inappropriate footwear. We saw a lot of people in running shoes or trainers. 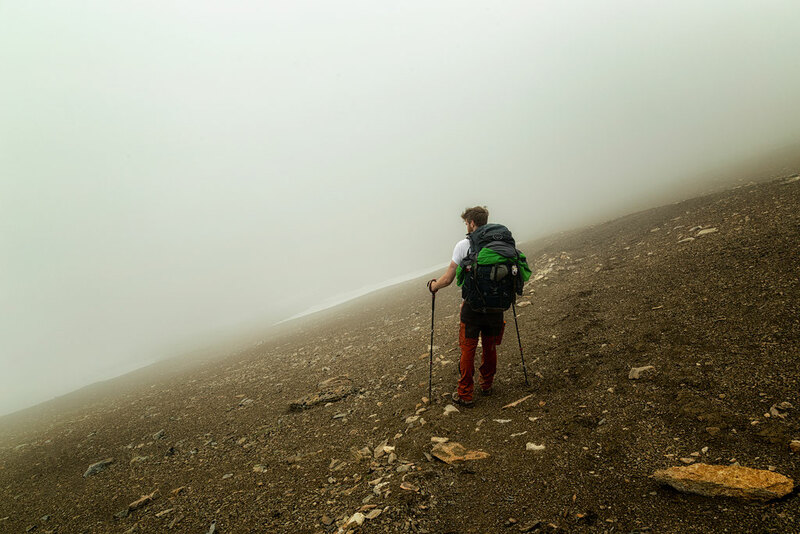 To make your experience more pleasant, above ankle waterproof hiking boots are a must unless you want to squelch 44km and end up with trench foot. 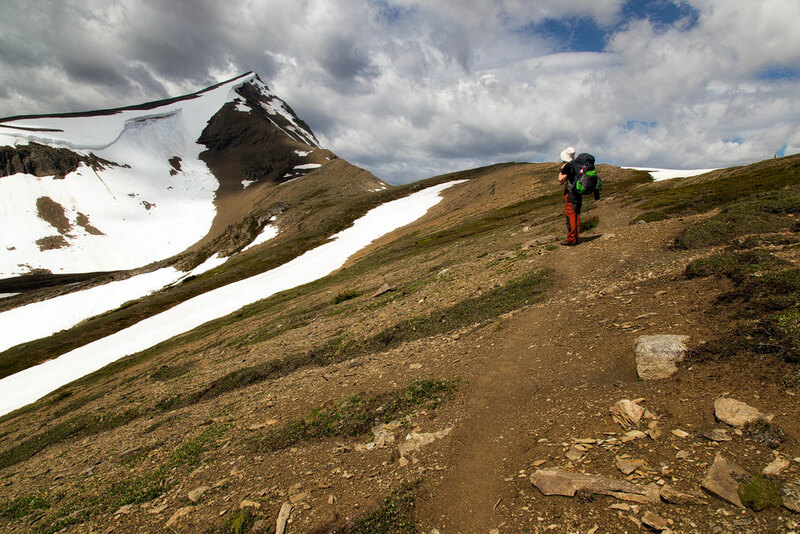 From Tekarra campground the trail heads uphill for a few kilometres as you approach your descent on north western slopes of the Maligne Range. Make the most of it because, before long, you'll be back within the tree line with no views at all. Once you pass the Signal Campsite you'll step foot onto the Signal Fire Road, a well maintained gravel road which will take you to the northern trailhead. This part of the trail, similar to the start is within the tree line and not particularly exciting but it's something that has to be done. Bears are common here so stay vigilant and make lots of noise. If you can't book the campsites you'd like or don't have the time to do the entire trail, or are fed up with the weather halfway through then from Curator Campground you can hike down on the Curator Trail through the forest emerging out near Wabasso Lake. Alternatively you can head east on the Watchtower Trail to the Maligne Lake Road. Both of these are options that can be considered when planning your trip. Also if you've still got energy, which I certainly didn't, there's a side trip to the summit of Signal Mountain. Always check the trail reports before leaving for any closures, bear sightings and weather conditions. You can view them on the Trail Conditions in Jasper website. In June and July there's lots of mosquitos. Come prepared with repellent, long sleeve tops, gloves and possibly a face net. Waterproof high ankle footwear is essential early on in the hiking season (June - July) when the trail is very muddy. The parking lot at the northern trailhead is tiny and extremely busy. In high season I saw cars parked along the road. If you can't find the spot, consider leaving your car at the Maligne Canyon car park instead or book the shuttle from Jasper.